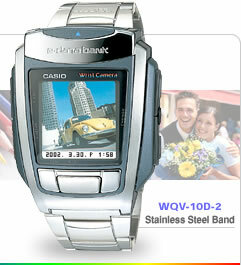 The new Wrist Camera is not only equipped with a color display, but with a digital 2X zoom as well. And, of course, you can edit the color images you take with your Wrist Camera after transferring them to your PC. Creative applications for your Wrist Camera images include digital photo album and Web site construction, among many others. * No adapter required for image transfer from WQV-10 to infrared communication port-equipped PC. * PAD-5/PAD-2B not compatible with infrared communication port-equipped PCs. * Here you can download a special driver that is required to use the PAD-5 IR Adapter with a computer running Windows(R) XP. *All images are superimposed photos; they were not shot with a WQV-10. *Design and specifications are subuject to change without notice. 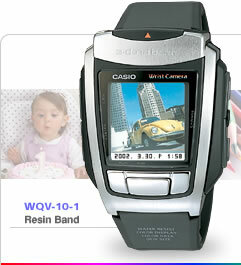 All Rights Reserved, Copyright (C) CASIO COMPUTER CO., LTD.